“Guido Reni 031” by Guido Reni – The Yorck Project: 10.000 Meisterwerke der Malerei. DVD-ROM, 2002. ISBN 3936122202. Distributed by DIRECTMEDIA Publishing GmbH.. Licensed under Public domain via Wikimedia Commons. 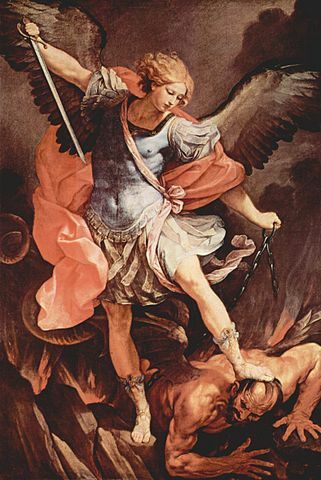 Today, September 29, is the Feast of St. Michael and All Angels, when we give thanks and praise to God for His holy angels and the protection from evil that He affords us by their agency. Lutherans have joined in celebrating this feast for centuries, and have adorned their homes and sanctuaries with hymns composed for the occasion. As of now, two of these hymns are available at the Free Lutheran Chorale-Book. Another hymn for the Feast of St. Michael and All Angels is Georg Reimann’s “In Love God Grants His Christians Dear” (“Aus Lieb läßt Gott den Christenheit“). Though Reimann departed this life to join the holy angels in 1615, the first appearance of his hymn is in the Preussische Fest-Lieder, Part 2, Königsberg, 1644, where it is joined to Johannes Eccard’s tune, “Aus Lieb lässt Gott.” It appears in C.F.W. Walther’s Kirchen-Gesangbuch as No. 155, but it is not present in English hymnals. Thanks be to God for the protection of His holy angels, who ever join us in singing His praises! This entry was posted in St. Michael and All Angels on September 29, 2014 by Christopher Neuendorf.